Here’s the safe way to photograph a rail car. A rail car is a jet engine on wheels – a nitrous-oxide fueled monster that can power through a mud bog in mere seconds. 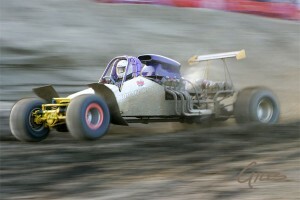 This is the best selling shot I took during the Hillbilly Crunch & Mud Bogs 2007. As more than 7900 frames were taken over the weekend, apparently I’ve got to work on my hit ratio… More notably, there’s a minimum amount of processing here as the photo you see was pretty much as shot in-camera. One of the reasons I enjoy event photography is for the excellent ‘front-and-centre’ seating it provides. It’s an excellent way to experience something different and meet exciting people. One can live vicariously through the subject. However, being this close to the action is not without its perils. Notice the position of this particular vehicle – parallel to me. This is very important. Why? Because I know where it’s going to be. At least, I hope I know where it’s going to be. Even the logically-challenged amongst us don’t have a tough time envisioning the route the car is supposed to take and will keep me out of harms way while allowing me the use of all four limbs. Life has a way of keeping things interesting… Here’s how not to shoot a rail car.